Karapet Bajakian, 37, is the man who not only renovates water pumps for cars, but also gives them a second life. Karapet is also one of the many Syrian-Armenians who have been through the atrocities of war. Shortly after resettling in Armenia in 2013, Karapet continued the family business he had established in Aleppo long ago. “It’s a family business; I started it with my dad when I was 16,” said Karapet who rebuilds water pumps for BMWs, Jaguars, Volvos, and Mercedes cars and busses. “Water pumps play an important role in the car’s cooling system. Although the pumps are built to last, they can sometimes break down and require replacement,” he explained, as he demonstrated the three phases of pump restoration. 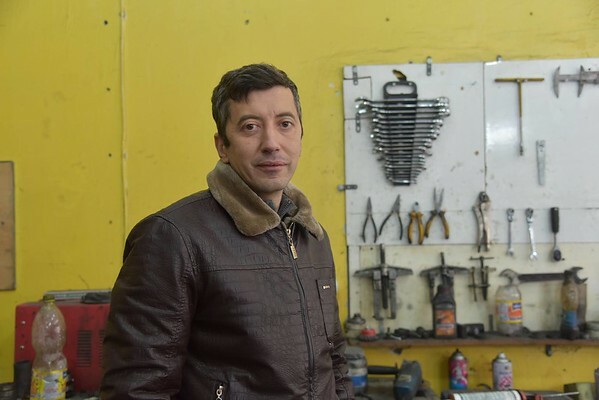 Last year, through FAR’s Small Business Assistance Program (SBA) grant, which specifically helps Syrian-Armenian entrepreneurs, Karapet was able to purchase equipment that has eased his work and helped him to build his business. “Before, I had to ask others to fix things like water pump items, now I do everything on my own. It’s also cost effective; I save about 60,000 to 70,000 AMD on average each month,” Karapet said. SBA started in 2016 and has thus far supported 17 Syrian-Armenian businessmen to either kick-start or develop their small businesses. Their businesses focus things as diverse as jewelry-making, metal work, food production, antique furniture repair, and language lessons. Karapet originally set up his business in a small space, until six months ago when he was able to move to a larger building that accommodated all of the equipment he purchased with the help of the SBA grant. Now, the big challenge for him is finding a place where he can store parts. Often, he has to import items in bulk from Japan, China, and Turkey. He also misses having a fancy billboard over his shop. But that, he says, will come.